It is 30 years from now, and China has colonized the moon. American Fred Fredericks is making his first trip and his purpose is to install a communications system for China's Lunar Science Foundation. But hours after his arrival, he witnesses a murder and is forced into hiding. Finally, there is Chan Qi. She is the daughter of the Minister of Finance, and without doubt a person of interest to those in power. 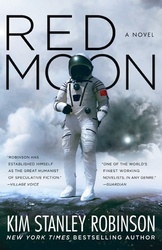 She is on the moon for reasons of her own, but when she attempts to return to China in secret, the events that unfold will change everything—on the moon, and on Earth.